"How severe the course of malaria gets, depends on the body's immune response," explains Hedda Wardemann from the German Cancer Research Center (Deutsches Krebsforschungszentrum, DKFZ). "Immune cells can destroy the pathogens that have invaded the body after a mosquito bite." "Studying the immune response of people who have been exposed to malaria parasites can provide clues about how we can make a malaria vaccine," explains Jean-Philippe Julien, Scientist from SickKids, with whom Wardemann and her team investigated antibodies against the malaria pathogen. The antibodies were obtained from study participants who have had repeated contact with the parasite in the past. Among the antibodies studied, the DKFZ and the SickKids scientists found a group that displayed a previously unnoticed characteristic that appears to be valuable for the immune system: They interact directly with each other. The antibodies can do so because the target structure where the antibodies attach on the malaria pathogen's surface has a special feature. "The protein contains a short sequence of four motifs that repeats itself many times," explained Wardemann, an immunologist. 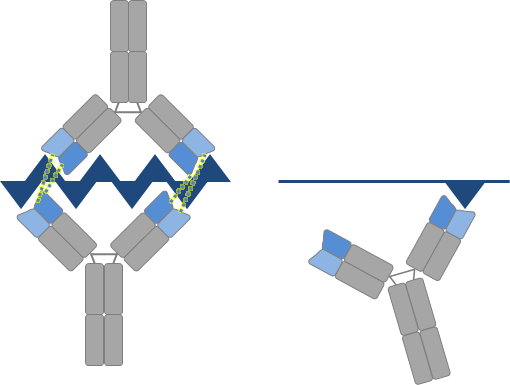 An antibody can attach to each of the sequence repeats. Neighbouring antibodies can then interact directly among each other. "This type of cooperation between antibodies has been unknown so far in humans," Julien said. "In an indirect way, it enhances the affinity of the antibodies to the pathogen, explaining why our immune system selects for these antibodies." The human immune system stores these protective antibodies in order to mount a better response in case of a new infection with the same pathogen. Subsequent diseases may then take a milder course - or be prevented altogether. This mimics the immunization effect from vaccines. Katharina Imkeller, Stephen W. Scally, Alexandre Bosch, Gemma Pidelaserra Martí, Giulia Costa, Gianna Triller, Rajagopal Murugan, Valerio Renna, Hassan Jumaa, Peter G. Kremsner, B. Kim Lee Sim, Stephen L. Hoffman, Benjamin Mordmüller, Elena Levashina, Jean-Philippe Julien, Hedda Wardemann. Anti-homotypic affinity maturation improves human B cell responses against a repetitive parasite antigen. Science 2018, DOI: 10.1126/science.aar5304. Picture Caption: Neighbouring antibodies directed against "repetitive" epitopes of the pathogen can cooperate with one another to enhance the binding affinity (left side). Use is free of charge. The German Cancer Research Center (Deutsches Krebsforschungszentrum, DKFZ) permits one-time use in the context of reporting about the topic covered in the press release. Images have to be cited as follows: "Source: Katharina Imkeller/DKFZ". Distribution of images to third parties is not permitted unless prior consent has been obtained from DKFZ's Press Office (phone: ++49-(0)6221 42 2854, E-mail: presse@dkfz.de). Any commercial use is prohibited.